Meanwhile, our programmatic business has been growing so fast that it demands the focused attention of its executives, as well as more investment – the opportunity is tremendous. 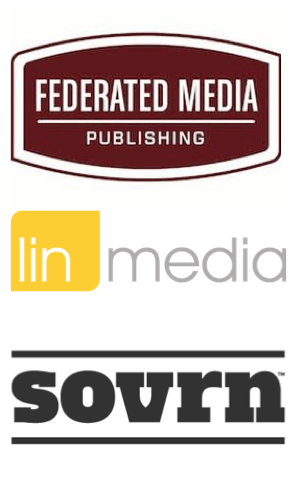 This transaction with LIN will allow the new company – sovrn – to pursue its dream of building a next-generation publisher-facing programmatic platform leveraging all the data and insights we’ve gained over the past few years. Personally, this deal means I will be stepping back into the role I had in 2011 and 2012, but now as Executive Chair of sovrn. (Yes, that means I can once again focus on writing, among other things!) Walter Knapp, my COO and the leader of our programmatic business, is stepping into the role of CEO of sovrn. It’s been an honor to work side by side with Walter over the past year, he’s incredibly talented and deeply passionate. I know with him at the helm, sovrn is going to do extraordinary things. And for Federated Media, the same team – all of them – who have been running our award-winning content marketing business will remain with Federated, and continue to work with our great publishing and marketing partners to power the best of the independent web. Chris Eberle, a wonderful and talented exec who I put in charge of the content marketing business last year, continues as Federated’s GM. And I’ll be working with LIN and Federated in various ways during the transition as well. I’ve seen a lot of ups and downs in my nearly 30 years working in this business, but I can honestly say that this deal feels special. I left Wired before it was sold to Conde Nast and Lycos, so I didn’t experience that transition. At the Industry Standard, well, I stayed till the bitter end, but the company didn’t make it – that story’s best told over a whisky. With the Web 2 conferences, I made the choice to stop even though the business was doing fine – a personal decision that allowed me to focus on FM and writing. But with FM, the circle has been completed – FM is moving on to a new chapter, with new leaders and owners, nearly nine years after its first steps. A couple of months ago my first child was admitted into the college of his choice, and in June we’ll be watching him leave the nest and explore new worlds. It’s bittersweet and emotional. I feel similarly about Federated – it’s time to help something I started head out into the world and into its next home. I’m thrilled that that home is LIN, a company whose people I’ve come to know and deeply respect. And I want everyone involved with FM to know I’ll always be there if they need advice and support. So, onwards! Here’s to a remarkable nine years with Federated, and here’s to the future of both Federated Media and sovrn, the company it helped to create. Congrats to you John, Walter, and the entire FM/Lin/Sovrn teams. Wishing all of you the best. Thanks Pete – and thanks for all you have done! Wow. What a journey it’s been. I still think some of the best campaign work I’ve done was at HP when I partnered with a very new company with a lot of talent called Federated Media. Congrats! Thanks Tac. I loved that work, and I know we’ll keep doing great things! Who would have imagined the sparks that created FM and Lijit would have evolved into a world class ad tech platform. Congratulations John & Walter! Congrats John! You and your team did a great job here. Congratulations. I have followed your dynamic career from a distance over the years since the Lair. In a non-stalker way, of course 😉 It’s great to see talent, ambition and perseverance pay off. Thanks JC – but wait, which JC is this?! It’s great to read your perspective on the merger; some entrepreneurs are good at finding great partners to advance their vision and some are not, you’ve proven to be successful at it! well done and congrats! Thanks. I’d not say I’m that great at it, just lucky sometimes, focused others, and f*cked up things other times. Pretty even scorecard. Congratulations! Well done John and crew. Deanna was a STUPID choice (thanks John Battlle) Deanna’s problem is that she always talked but never listened — there’s no such thing as a conversation with Deanna. She talks, you listen. She may be deaf, for all I know. If she engaged other people and learned from them, she’d be much more effective manager and she’d be able to build more successful products. Deanna’s other problem is that she has tons of ideas (some may even be her own ideas), some good and some bad, but it doesn’t matter because she just can’t execute on them. She can’t execute on them because her knowledge is so superficial that she doesn’t know where to start or how to determine if it’s done properly. Because she can’t talk with people to learn, diagnose and fix problems, nothing happens. Deanna has had five jobs since 2000. I’ve had only 4 jobs (Cambridge Scientific Abstracts, Phoenix Systems/Corporate Software, Microsoft and Recipezaar) in my 19-year career. Deanna changes jobs more often than I buy new shoes! How people like Deanna can get hired with a resume that shows no success, is a habitual quitter and clearly leaves jobs just before she’s fired is beyond me. You gotta be a real dummy to hire her. Sorry, John Battelle, you is a dummy. BLOGGER BEWARE – SOVRN HOLDINGS DOES NOT PAY!!!! Apparently, Sovrn thinks that it is ok to steal ad space from Mom’s doing their best to earn extra money for their families. I am by no means a big blogger, but I do have 250,000+ page views a month. I made the mistake of testing a few ads low on my website late last fall and early this year. I have emails from a Taylor Hamill (Ad Operations Manager) in January, February and March of this year indicating each month that there was a problem with my set up and that is was corrected now and I should expect payment. Each time he apologized for the issue on their end. Miraculously the problem that Taylor assured me was corrected reappeared the following month. I have at least 12 emails and support requests that have not been responded to. It is April now and I should have received a payment in December. At this point it is clear that they have no intention of paying. It is sad that big companies like this think that it is ok to take advantage of individual bloggers. Wendy thanks for taking the time to complain and I’ve escalated this at sovrn. We’ll get right back to you and I’m very sorry this happened. Next Next post: Step One: Turn The World To Data. Step Two?